"bloggers made me do it"
It probably comes as no surprise to any of you that I may have done a littleee bit of damage in Boots last week. I didn't go too crazy (my bank balance couldn't quite fund a full on splurge) but I'm super happy with all the things I did manage to pick up, most of which were inspired by bloggers or reviews I've seen recently. This is a kind of 'bloggers made me do it' inspired post sharing some of the things I picked up, who the purchases were inspired by and also my first impression of the products. 1) Revlon Colorstay Concealer (02 Light Pale) This purchase was inspired by the lovely Lily Pebbles (blog crush right there) after I saw her using it in a video she posted a couple of weeks ago. Similarly to me she said she didn't always enjoy the Collection Lasting Perfection concealer as much as it was hyped about so I was really interested to try this and see if I preferred it too. I find the formula of this product is SO much better than any other drugstore concealer I've used in the past because it's not at all cakey and gives just the right amount of coverage. I think the shade I picked up is a near perfect colour match for me and I'm just really loving this for covering blemishes at the moment! 2) Real Techniques Miracle Complexion Sponge. Again a recommendation from Lily, I picked up the RT take on the beauty blender because I've always been so intrigued by the idea of a sponge for a more natural look with foundation. So far I wouldn't say I'm overly impressed with the sponge in terms of using for foundation because I just don't feel like it can blend the product in for the amount of coverage I like but I have really enjoyed using it with the Revlon concealer. The idea behind it is the wet the sponge so it's slightly damp and use it to blend in foundation/concelaer for a more natural, glowy finish. I'd 100% recommend this for concealing but I'm not sure if I'll be using it for my whole base on a daily basis because my love affair with the Bobbi Brown full coverage face brush is still ongoing. If you're undecided about the higher price tag of the beauty blender this is a far more affordable version to try! 3) Collection Fast Stroke Liquid Liner. For any long time CW readers you'll know eyeliner isn't exactly my area of expertise. I've only ever used liquid liners in the felt tip form so thought this would be good to try and see if I found it any easier and I'm so glad I did! This makes applying eyeliner so much easier and the finish is far better. The colour is jet black and it hasn't smudged at all on me which I sometimes found with the S&G supercat liner. I find applying eyeliner more precisely far more easier now and it also makes winged liner a lot simpler. One for your shopping basket for sure! 4) Maybelline Brow Drama sculpting brow mascara (Dark Blonde) Brows are my nemesis. I struggle every day to get my brows looking okay and so when I saw Kate from the blog and yt chanel Gh0stparties talking about Benefit Gimme Brow I was practically sold...until I saw the pricetag. I've seen lots of reviews saying that Brow Drama from Maybelline is really comparable to its Benefit rival and I'm so glad I picked up this version because I love it and for only a fraction of the price! 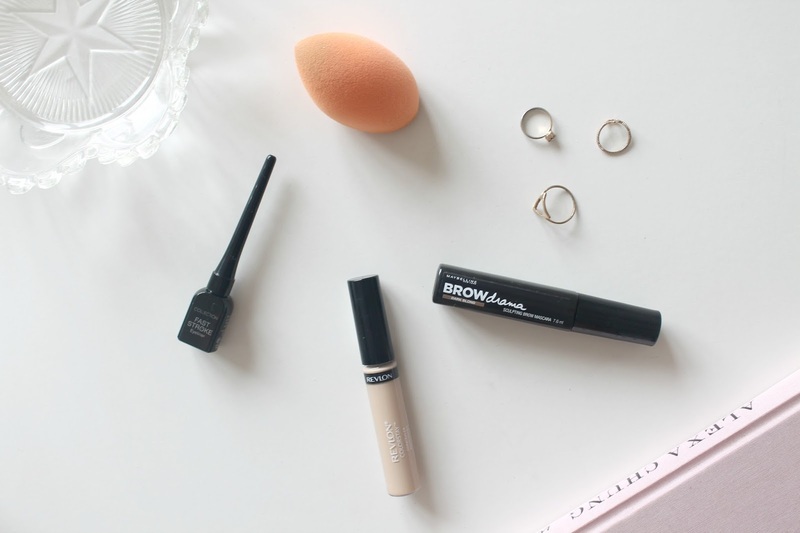 I use this as the last step in my brow routine to set everything in place but also to add a little more colour to any sparse areas. I would really recommend this to anyone else who finds brows a little on the tricky side because it's such a great product and honestly makes such a difference to the look of my eyebrows! I hope you enjoyed seeing the products I've picked up recently and a brief review of them. Let me know if there's any you would like me to talk about in more detail!